Over the course of these reviews certain themes become apparent when revisiting artists every few months when a new record comes out. Some of these are only touched upon in passing and others may fly completely under the radar unless you’re specifically looking for them, but oftentimes – usually when it is a negative trend – these can become a dominant theme as we chart an artist’s path. With The Orioles there have been dueling themes we’ve been discussing over the span of eight songs that have been released on what is now four (and a half) singles. The most promising of the themes, and thus the one history has rightly focused on, has been their introduction of a different viewpoint into rock, one built on the churning emotions of those who find themselves questioning whether the love they feel is going to be reciprocated. By using the perspective of someone lacking in experience in this field they’ve been able to perfectly reflect their young audience’s own lack of worldliness as they too reached adulthood. That’s the connection which made Sonny Til & The Orioles so beloved right out of the gate, a feeling that the viewpoints and experiences of artist and audience were one in the same. But the far more troubling theme has been found lurking on each and every record we’ve come across to this point which is the lack of faith they all seemed to have in trusting that young fervent audience to sustain their careers over the long haul. So each step along the way they’ve attempted to discard them for a presumably more stable, more affluent, older and more white bread listener, the kind who passively tunes into the pop stations rather than the younger more passionate black audience who eagerly seeks out and absorbs every shred of music aimed their way. Yet the more blatantly The Orioles tried “crossing over” with pop slanted songs and deliveries the worse the results were, both aesthetically and commercially. Finally though, with a return to the emotional power they did so well on the top side of this single, Tell Me So, they would enjoy their biggest hit this decade. What’s even more promising is that for once they didn’t hedge their bets by aiming for the supper club crowd on the flip side, instead they paired it with Deacon Jones, their most energetic rocker to date and the result is arguably the best two-sided record the legendary group would ever release and perhaps a statement that from now on they intended to reward the constituency who actually gave a damn about them – the rock fan. It’s interesting to note that for all of the talk of rock’s rapid ascent from start-up genre to a heavyweight presence on the Billboard Race Charts in just about a year’s time that during that period from September 1947 through August 1948, the unquestioned top breakthrough star in all forms of black music was NOT a rock act. 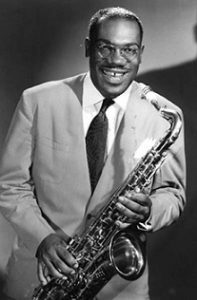 It was Benjamin “Bull Moose” Jackson, an affable tenor sax player turned crooning vocalist who symbolized the unexpected but quickly growing dividing line between the old school styles and the new rock landscape. One month after rock made its debut with Roy Brown’s Good Rocking Tonight, Bull Moose Jackson broke through with a lovely ballad entitled I Love You, Yes I Do. It was a song helmed by Henry Glover who had been a trumpeter in Millinder’s band alongside Jackson and who now was put in charge of King Records musical productions, a rarity for a black man in the 1940’s. Though it was a restrained arrangement the melody and lyrics were exquisite and as sung by Jackson it managed to retain a bit of soulful longing. It was conceivable that it could fit into the rock genre on its own, provided Jackson, who’d been doing primarily rhythmic based material prior to this continued to pursue that direction as well. King Records, bowled over at the news that I Love You, Yes I Do had done the unthinkable and crossed into the pop charts, promptly abandoned their genre straddling potential and subsequently aimed Jackson squarely at the white mainstream (sound familiar?). Maybe not surprisingly he didn’t connect in that way again but it didn’t mean he wasn’t hugely successful at appealing to slightly older and more sedate black audiences who were thrilled to hear a representative from their own culture singing in this way. But in an alternate reality Jackson might very well have been one of those poised to lead rock forward as well, provided he’d been given the chance to do so. Time for one of our renowned detours, but fear not, this one happens to involve one of our favorite characters, the irascible Wynonie Harris, which as regular readers know means trouble with a capital T.
The fact is if not for Wynonie Harris and his petulant nature then Bull Moose Jackson would likely never have become a solo artist OR a singer for that matter as he had always been perfectly content to play saxophone in Lucky Millinder’s acclaimed group alongside a wide array of stellar musicians. For awhile that group was fronted by none other than Wynonie Harris who felt that he was deserving of far more money than he was being paid. Hardly surprising there as Harris felt he was entitled to more of everything simply because he was Wynonie Harris and you weren’t. When he demanded a raise and was rebuffed he promptly quit the act while the group was touring Texas in 1944 and faced with the prospects of silence where the lead singer was supposed to be Millinder grabbed the startled Jackson out of the horn section and told the gawky deer-in-the-headlights looking kid to sing. Whaddaya know, he liked it. Jackson therefore became a dual threat, still working with Millinder but now with prospects of venturing out on record under his own name, all with Lucky’s full consent mind you. Jackson’s first few years saw him tackling largely rhythm numbers on record including the sequel to the song that had originally made Wynonie Harris’s name while he was with Millinder, Who Threw The Whiskey In The Well, a proto-rock song featuring a hand-clapped back beat and a storyline about a wayward Deacon who smuggles booze into a church service and a party ensues – a situation Wynonie certainly knew first hand and had delivered with suitable panache. Jackson’s update of it under Millinder’s direction, I Know Who Threw The Whiskey In The Well, if anything, ramped up the excitement with more prominent drums and gospel harmonies backing Jackson’s genial vocals and he was rewarded for it when it too became a hit. But then he went dry despite some good tunes and so when Glover came up with a ballad to try to mix things up from Jackson’s usual uptempo – but still not quite rock – efforts it wound up being the turning point in his career. Following that unexpected success with I Love You, Yes I Do everybody involved was beset with an incurable case of dreadful predictability, namely cutting nothing BUT pleasant ballads stripped even more of their racier attributes in an effort to replicate that feat. In the process they all but abandoned the rhythm records Bull Moose had done so well. Ironically one of the last released in that vein for quite awhile was the third part to the Whiskey saga entitled Fare Thee Well Deacon Jones, probably the BEST of the trilogy but in June of 1948 when it was released (as the B-side to the eventual #1 ballad I Can’t Go On Without You) the song was well behind the advances made in rock when it came to really exciting a crowd, something spearheaded over the previous months by none other than Wynonie Harris, the man who started all of this drama in the first place. So that’s the long and twisted origins of the record The Orioles adapt here for a rock audience at last. They’ve shortened the title to Deacon Jones and altered its arrangement to suit their much different personnel but the storyline, which was a highlight of the Jackson record, remains intact as it recounts the aftermath of the first two episodes of the tale stretching back now five full years. For those who just want a simple recap instead, the gist of the story leading up to this installment is the whiskey soaked party in the church in Part One as delivered by Harris found a sloshed Deacon Jones accused of sinful corruption by the congregation who all end up shooting craps after inadvertently sampling the tainted water. Jackson’s follow-up finds a hung over Deacon Jones ratting out the perpetrator of this sin (and sinning himself by lying about how he got drunk in the first place – claiming a bottle was thrown through the window and hit him in the head). His flimsy excuse of course rings hollow which sets up the third part – THIS part – in which Jones, who kept drinking throughout all this, is sprawled out in a coffin, having been pronounced dead, although dead drunk is more like it. 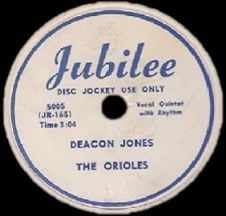 The Orioles shake things up right away on their Deacon Jones, adding a spoken intro which tells us that the Deacon apparently didn’t WANT to be saved (from drinking or from death, they’re probably one in the same) and conked out the night before. This adds gravity to the proceedings, yet also leads perfectly into the tremendous group vocals topped by Sonny Til giving one of his few uptempo gospel infused leads while the others harmonize behind him like a righteous choir. This is arguably the best we’ve heard The Orioles sound as a unit. Normally the others provide very tentative support to Til, delicate in their deliveries, careful not to intrude on the fragile mood they’re trying to get across. Not so here, where they are rambunctious and inspired throughout bringing this as close to gospel as we’ll hear from them until 1953, albeit then in a much different form. Deacon Jones rides their enthusiasm like a runaway train, supported by a few piano fills and George Nelson’s stand up bass, the rest is all voices with their humming providing the rhythm bed they ride over. The handclaps that come in are nowhere near as prominent – or syncopated – as on Jackson’s take on this, nor does this have the solid sax solo that Bull Moose himself blew on the original. Instead The Orioles make up for all of that with their relentless group singing, trading off lines, tossing in shouted asides and letting Alex Sharp’s falsetto soar intermittently over the top. The first half is about as perfect as a record can sound, even when comparing it to the very good version by Jackson. But two things cut Deacon Jones down to size ever so slightly. The first is that The Orioles have an established image going into this that differs greatly from Bull Moose Jackson who had been ideally suited for the astonished onlooker who jumps behind a bench when the deceased Deacon starts to rise in his coffin. Jackson had always been presented with a bit of an aww-shucks gullibility, someone who’s prone to taking things literally yet with a cheery joyfulness that accepts whatever he encounters. That persona fit his role on the song perfectly, something The Orioles can’t quite match on theirs. When Jackson then yields the floor to the Deacon himself (really another band member playing the role of the Deacon) who delivers the explanation for his resurrection it serves as the capper to all this. 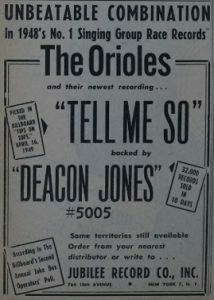 That authoritative voice adds immeasurably to the theatrical feel of the original, something which The Orioles oddly enough don’t try and replicate even though Nelson routinely handled the vocal bridges in the more typically delivered songs and for once his participation in that department here would’ve been most welcome. Instead they let Til handle both roles and it robs the song of the contrast that worked so well in Jackson’s take on things. The other unfortunate – and inexplicable – change is that in Jackson’s version the Deacon cries out loud and clear “You’re going to hell all you sinners!”, but The Orioles bowdlerize the lyrics to “You’re going below all you sinners”. Aside from not comprehending that rock as a whole embraces foul language, or at least would consistently in the future, their alteration ruins the scansion of the line, although they amend the second half to try and make it work by saying “You gotta go”, thereby rhyming “below” and “go”. Since Jackson’s version had the Deacon loudly and almost violently repeat the charge, then throw in a THIRD hell on the next line to rhyme it with “fare thee well”, it came off as a more suitable and entirely fitting conclusion to all of this. The Orioles by contrast pull back on the ending. 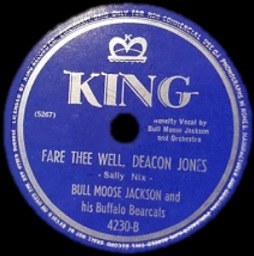 It’s still sung well but the entire character of Deacon Jones is transformed from a loud-mouthed drunk trying desperately to cover his own guilt by acting in an exaggerated manner, hoping his bluster will overwhelm their suspicions, to the relatively harmless souse The Orioles offer him up as instead, someone sheepishly explaining away his actions that led to this point. If you could somehow graft the second half of Jackson’s record onto the first half of The Orioles – or better still, simply get The Orioles to imitate Bull Moose and company more closely while winding it up – this would be unbeatable. In fact The Orioles, with the aforementioned tweaks to both sides of this single, had a shot for the first record to earn a ★ 10 ★ on both sides. In the end they shortchanged themselves, not once but twice. As it is Deacon Jones is still pretty damn good, a rousing reminder just what type of attitude and energy goes into some of the best rock ‘n’ roll, no matter the origins. Hearing Sonny Til wail so fervently makes you wonder why they hadn’t tried that approach earlier and – spoiler alert – why they’d largely avoid it again from here on in. THIS was the type of two-sided record The Orioles should’ve and certainly could’ve been putting out for years. Tender balladry ripping at your soul on one side and spirited off-color romps that showcased their harmonies and vocal diversity on the flips. Sadly this was one of their few efforts that managed to pull off such an approach. They became one of the top rock groups in spite of a somewhat repetitive stylistic structure and 1949 would be their biggest year, the top side of this being what ignited their commercial run. While Deacon Jones inexplicably didn’t piggy-back it onto the charts (still limited to 15 spots, so it’s not as if there was much room for a drunken louse like the Deacon), this showed that they indeed had it in them to dazzle you in more ways than one. 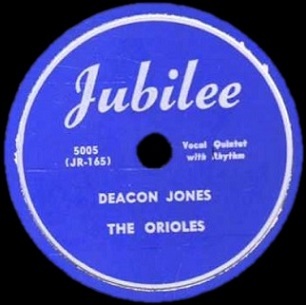 Leave a reply on "The Orioles: “Deacon Jones”"